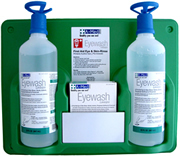 Multi-Purpose First Aid Eyewash and Skin Rinse with one "all risks" formula. Unique "Eye Opener" eliminates the need for an eye cup and saves precious second in an emergency with it's instant "Twist for Activation" design; very innovatiove and much more effective than traditional eyewash with eyecups. "Eye Opener" allows a "free" hand to open the eye. First ever FDA approved dual claim eyewash to be used as "Eye Wash" as well as "Skin Flush". First ever eyewash with a 4 year expiration date! Filter 25g/m2 (BFE 97-98%) at middle. ES Thermalbonded 20g/m2 at back. PP Thermalbonded 20g/m2 at edge. 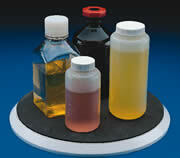 These bottles are flexible and feature a wide-mouth opening for easy filling and emptying of liquids and powders. The deep threaded neck allows the screw cap to seal on tight, offering exceptional leak-resistance, especially during shipping. This bottle is approved for use with food products. oz ml Height I.D. O.D. 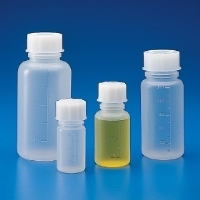 These rupture-resistant bottles are extremely rigid and feature a wide-mouth opening for easy filling and emptying of liquids and powders. The deep threaded neck allows the screw cap to seal on tight, offering exceptional leak-resistance, especially during shipping. This bottle is approved for use with food products. Multi-lingual wide mouth wash bottles featuring the patented DripLok® vapor venting valve that prevents solvent drips. Indelibly printed in 4 languages: English, French, German and Spanish. Choose from four solvent labels, all including the new Globally Harmonized Symbols, NFPA diamond, risk phrases and safety information. Fitted with color coded one-piece PP closures that maintain their shape in use. Closures feature precision jet-tip aperture for fine control. Permanently Labeled/Color-Coded Wash Bottles. These safe wash bottles, which are permanently labeled and color-coded, eliminate the risk of dispensing the wrong liquid by mistake. 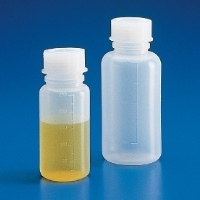 All of these wide-mouth (easy transfer liquid) polyethylene bottles have polyalomer caps and a fine-tip-nozzle that may be cut back for heavier flow. Capacity is 16 oz (500 ml), low density polyethylene. These boxes are used to dispose of empty ampoules, broken glass, empty vials, biohazard wastes, etc. The outer box is made from corrugated cardboard; the inner one is a 2-mil polypropylene bag. When the box is full, the safety cap is pulled into place and the entire unit is ready for disposal or incineration. There are no replacement bags for these boxes. These pouches are 4¼"x7½"x3" on the outer measurements. Inner measurements are 3¾"x6"x2½". (LxHxW) They are made of aluminum foil and multi-layered polyethylene. These are suitable to store items that have a sensitivity to oxygen and/or moisture. They have a tear-off notch above the zipper. Can be resealed by heat or the zipper. Also compatible with vacuum sealers. Made of 10 mil solid paperboard, which opens to an oval shape by folding the bottom flaps. When full just close the top flaps and lock into place. Ideal for needles, razor blades, scalpel blades, etc. 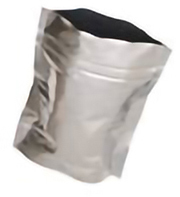 An epoxy coated steel wire pouch stand provides stable support to that keeps the pouch standing upright. 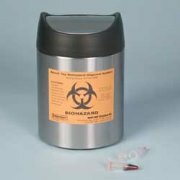 This biohazard-labeled, bench-top disposal can is ideal for quick convenient disposal of items like pipette tips, microcentrifuge tubes, lab wipes, and more. Aesthetic and durable, it is made of 400-series brushed stainless steel that resists fingerprint smudges and stains. 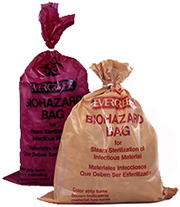 EMS introduces autoclavable biohazard bags. Made from 0.002" thick polypropylene, they provide excellent heat and are tear and puncture resistance. Available in red and tan. 8 x 12" bags measure 0.0018" thick. Maximum autoclave temperatures are: 147°C (297°F). The soft, ribbed material fits in drawers or on the shelves to keep fragile items from rolling when drawers are opened or closed. The base has 12.75" diameter. This ¼" (6.4mm) thick lead shield protects against chemical reactions and nuclear radiation. The shield is coated with vinyl for a soft smooth surface, which eliminates the hazard of any skin contact as well as flying debris. 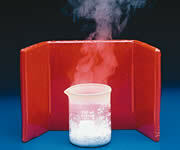 Splash Protecting in Standing or Sitting Position Provides good protection personal from pipetting or pouring chemicals. An extra wide, angled viewing area and low bend allow the shield to be used from a standing or sitting position. Made from 6.4 mm (¼") thick clear acrylic with non-skid feet for stability. Acrylic base work area is 50.8 x 30.5 cm (20 x 12") deep. Face is 50.9 x 38 cm (20 x 15") high. Not recommended for Beta use. This shield is a solid, molded, clear-acrylic block with 13 wells 11mm in diameter. It holds 13 of 1.5 ml micro sample tubes (EMS Cat. #72363) or similar. A clear tight-fitting cover allows space for the micro tube flip top. It is ideal for DNA sequencing. Measures 2-1/16 "x 4⅛" x 2-7/16" (H) (52 x 105 x 62 mm). Tubes not included. This disposable, activated charcoal cartridge efficiently absorbs low energy 35S radioactive components during metabolic labeling. The containment problem exists in incubators and is caused by 35S-labeled amino acids, such as methionine and cysteine which are used to label proteins. The charcoal is supplied in a 100mm diameter plastic petri dish with a highly porous membrane sealed to the top edge. Made from strong silicone and it withstands temperatures as high as 500°F (260°C). A gripping surface with built in multi suction studs for a non-slip grip. Has two pockets for thumb and fingers. A thickness of 0.001" "PTFE" film bonded to a 0.008" self-adhesive vinyl gives your work surface good protection. Easy to use: cut to desired size, remove the backing, and press into place. These Lab Mats are made from a durable FDA approved silicone material that creates a stain resistant washable working surface to help keep benchtops clean and safe from stains, spills and wear. They will also save you waste and money by eliminating repeated purchases and disposal costs associated with disposable paper mats, making them a more environmentally friendly option. When finished with the mat, easily wipe it with any standard disinfectant or put in a dishwasher, to reuse later. The mat features a large, anti-skid, working surface which helps keep items in place and prevents the lab mat from sliding out from underneath. The mat's surface is also noise dampening, reducing sound from the vibration of common benchtop equipment. It can be used with items such as centrifuges, vortex mixers, hot plates, stirrers, pipettes and so much more. When using magnetic stirrers, the mat has a designated area with internal metal inserts to keep stir bars from wandering around the working surface. It also features a lip design around the outer edge to help contain spillage that may occur, keeping benchtops safe and clean. 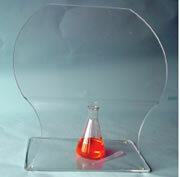 Clear polyethylene ribbed matting can be used for lining laboratory bench top, shelves, trays, etc. It is easily trimmed and also works well under drums or carboys. 0.25mm (.010") width 0.7mm (.030") thick ribs, 76cm (30") wide x 15.2 meter (50 ft) and 4.6 meter (15 ft) roll. 1 roll/box.